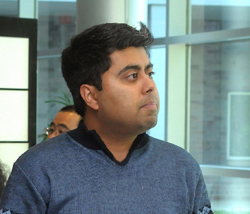 Deepkishore Mukhopadhyay was a postdoc at the Center for Nanoscale Materials and former Postdoctoral Society of Argonne president. Today he is working at Bruker Nano., Inc., a division of Bruker Corporation, a global manufacturer of scientific instruments for molecular and materials research, as well as for industrial and applied analysis. Bruker has numerous divisions that perform research in Nuclear Magnetic Resonance (NMR), Electron Spin Resonance (ESR), Fourier Transform Infrared (FT-IR) Spectrometry and X-ray Spectroscopy. Deep works as a Microelectromechanical Systems (MEMS) Engineer at the Bruker Nano, Camarillo, Calif. facility. He performs research work in probe development engineering with components between 1 to 100 micrometers in size. Deep contributes to Bruker MEMS projects on both individual- and team-based development efforts. He is tasked with transitioning basic research and development projects to manufacturing. This process, also known as “scaling-up”, is a crucial part of a research company’s development. Being able to take a new product from a laboratory quantity to a commercial quantity is a challenge that corporations live and die by. His team is currently working to commercialize next-generation Atomic Force Microscope (AFM) probes. These probes are used as measuring devices and to manipulate matter in high-resolution, nanoscale microscopy. The team’s work will significantly extend Bruker AFM systems’ capabilities in the realm of the science of measurement or metrology. Deep found his current position by using an extended network of connections. He heavily relied on professional social-media during his job search. “It took about six months to get an offer after I started sending out resumes,” says Deep. He recommends being proactive and to start looking for positions as soon as possible. Deep used his Argonne postdoctoral fellowship to help launch his scientific career. He managed his postdoctoral research alongside an active career search. Before he began his search Deep took the time to identify his personal goals, what motivates him and discover what it was that he wanted to do with his life. Finding one’s vocation, where one desires to be career-wise and how to get there takes time. “It takes a long time, much longer than one would assume, to develop a network and leverage it to find a fulfilling position,” says Deep. Deep advises postdocs to use their time at Argonne to learn as much as they can and to hone their research skills. He encourages postdocs not to limit themselves and to keep their horizons open by considering opportunities outside of Argonne. While at Argonne, Deep enjoyed the relaxed atmosphere, excellent work-life balance and beautiful campus. He misses his kind colleagues and his wonderful supervisor Daniel Lopez at the CNM. 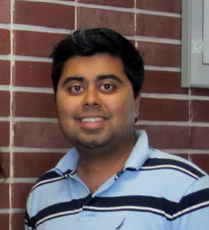 This entry was posted in Alumni News, Announcements and tagged Alumni News, Deepkishore Mukhopadhyay, network, outreach. Bookmark the permalink.